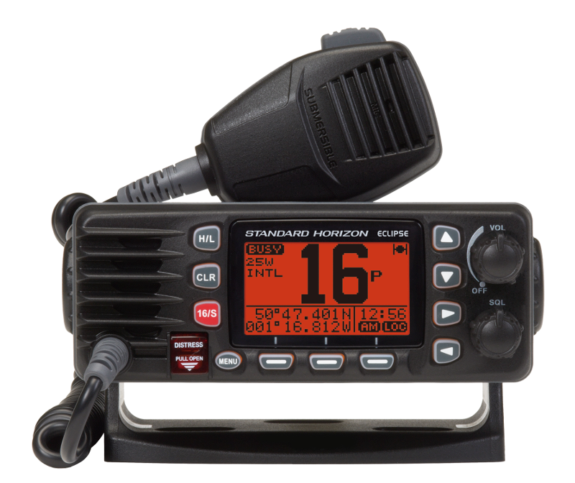 Standard Horizon GX1300E Eclipse DSC VHF Marine Transceiver. Standard Horizon GX1300E is an Ultra Slim and Compact Rear Case First Fixed Mount VHF with built in GPS. Supplied With Three Years Yaesu UK Warranty. Channels All USA, International and Canadian. Input Voltage 13.8 VDC +-20%. Receiver (Max AF Output) 1.0A. Transmit 5.5A (Hi), 1.5A (Lo). Dimensions (W x H x D, mm) 155 x 60 x 150. Flush Mount Dimensions (W x H x D, mm) 131 x 51 x 140. Frequency Range 156.025 to 157.425 MHz. RF Output Power 25W (Hi), 1W (Lo). Conducted Spurious Emissions Less than -80dBc (Hi), -66dBc (Lo). Audio Response within +1/-3dB of a 6db Octave. Pre-emphasis characteristic at 300 to 3000Hz. Audio Distortion less than 5%. Modulation 16K0G3E (for Voice), 16K0G2B (for DSC). Frequency Stability ±3ppm (-20ºC to +60ºC). FM Hum and Noise 50dB. RECEIVER (For Voice and DSC) . Frequency Range 156.050 to 162.000MHz. Spurious and Image Rejection 75dB. Audio Output 4.5W (@ 4Ω external speaker output)Frequency Stability ±3ppm (-20ºC to +60ºC)Channel Spacing 25kHz. NMEA 0183 GPS Input (4800 baud) for posn data GSA, GSV, GGA, GLL, GNS, RMC. NMEA 0183 DSC Output (4800 baud) DSC and DSE. Amateur Radio Sales.HAM Radio Sales. Standard Horizon GX1300E Amateur Radio Shops HAM Radio Dealer Supplier Retailer. Near The Alhambra Shopping Centre.Barnsley, South Yorkshire, UK.Amateur Radio Sales.HAM Radio Sales.We are Premier Dealers For Icom, Kenwood & Yaesu.